I'm incredibly grateful to have such amazing opportunities in my career due to the dedication of FPE faculty and staff. I chose to study at UMD because I was born in Maryland - I have lived here all my life - so there wasn't really any other option for me. Additionally, I was particularly attracted to the A. James Clark engineering school at UMD. How did you hear about the Dept of Fire Protection Engineering, and what attracted you to the major? Another firefighter at my fire department (where I've been volunteering since I was 16) had recently graduated from the program and recommended it to me. I already knew that I wanted to be an engineer - my brother is also an engineer so I became familiar with the field early on - so I decided to give fire protection a shot! What’s been the best thing about your academic experience here so far? The best thing about my academic experience so far has been my friends, faculty and staff within the Department of Fire Protection Engineering. I am incredibly grateful to have such amazing opportunities in my career due to the dedication of faculty and staff within the department, as well as the support of my friends within my cohort of fire protection engineering students. Which has been your favorite class and why? My favorite class has been ENFP310 taught by Ken Isman. I found this class to be very interesting and practical. Additionally, Mr. Isman is incredibly knowledgeable of the subject which made the class even more appreciable. Engineering can be an intensely difficult major. Do you have any suggestions for other students on how to manage it (inside or outside the classroom)? Always reach out to your classmates for help. More than likely, other students in your cohort are struggling with the same classes and concepts, and working together (when allowed) is a great way to learn material and also build friendships. What do you do for fun, outside the classroom/lab? 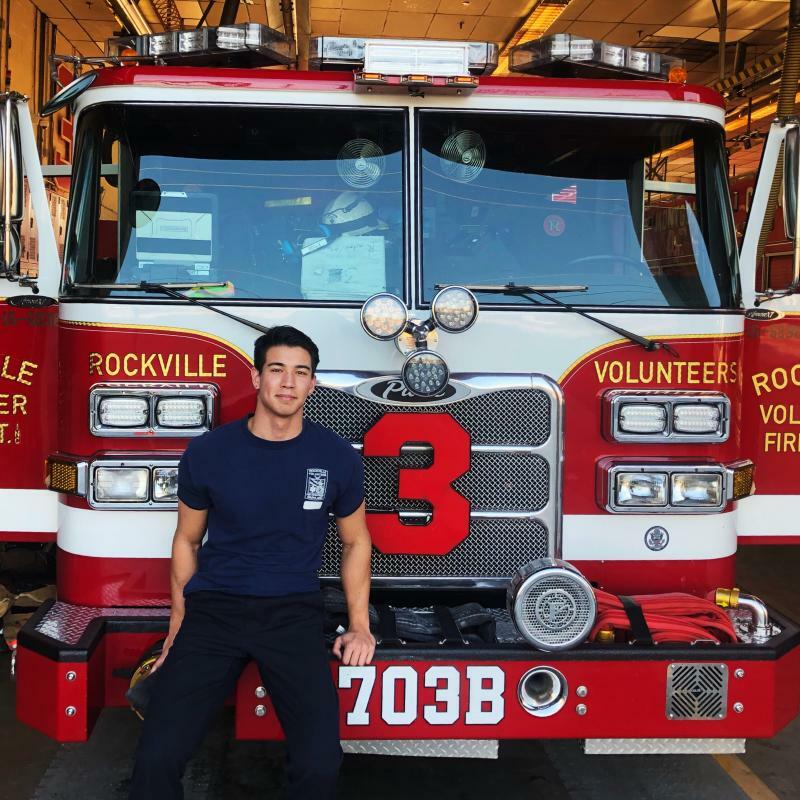 Outside of school, I am typically at the firehouse where I am a volunteer firefighter at the Rockville Volunteer Fire Department in Rockville, Maryland. I am a live-in firefighter, which means I live at the firehouse and staff firetrucks during the weeknights and weekends. We are constantly running drills and fielding calls, which keeps me busy outside of class. Juggling work and academic responsibilities can be difficult, so I always carry a 'balance forward' list, and carefully prioritize my time. I also enjoy playing volleyball during the summer, skiing in the winter, and I love to travel. My post-graduation plan is to work as an engineering consultant and eventually get my Professional Engineer license. I also plan to work towards obtaining a Masters of Engineering degree in Fire Protection Engineering from UMD as well. *Update: Chris recently signed with Jensen Hughes, where he's been interning, too, and will start with them this summer. He also plans to pursue his Master's in FPE part-time.